"Family recipe for German peppernuts. Small, dense spice cookies that are tantalizing when dipped in coffee, or great on their own. This is the traditional version with molasses." In a medium bowl, cream together the shortening and brown sugar until smooth. Mix in molasses, anise oil, and egg. Dissolve baking soda in hot water, and stir into the mixture. Combine the flour, salt, cinnamon, ginger and white pepper; blend into the molasses mixture until uniform. Knead for a minute until easy to work with. 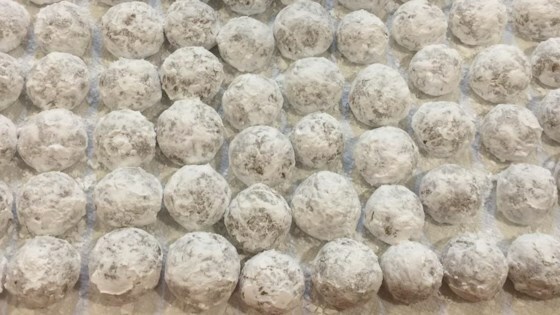 Shape dough into 1 inch balls, and place 1 inch apart onto ungreased cookie sheets. Bake for 10 to 12 minutes in the preheated oven, until slightly browned on the bottom. Do not over bake, or they will be very hard. Store cooled cookies in an airtight container at room temperature. Slices of seasoned beef and lamb meatloaf served on pita with all the fixings. Excellent; easy to make; after baking, roll in powdered sugard. I used black pepper instead of white pepper and these came out just fine.. makes the house smell wonderful.